August 18, 2017 – Honda Cars Philippines, Inc. (HCPI), Honda’s automobile business unit in the Philippines, is proud to announce that the recently launched All-New CR-V (August 8, 2017) has been awarded a 5-star safety rating by the ASEAN New Car Assessment Program for Southeast Asia (NCAP). 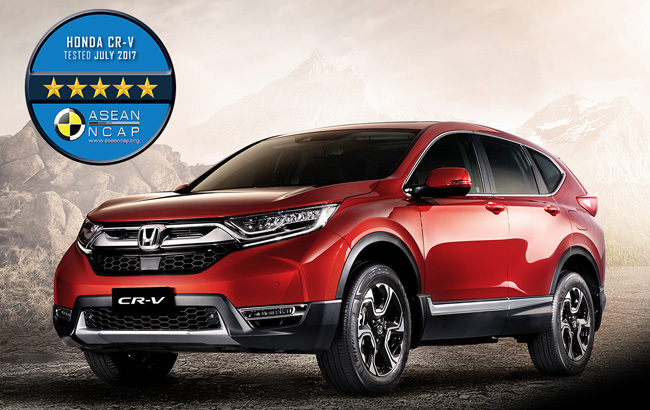 The All-New CR-V is the first model of Honda to be awarded by a 5-star safety rating under the new ASEAN NCAP Assessment 2017-2020 Protocol. The new assessment protocol urges carmakers to give the best safety practices in the region and has been in effect since January 1, 2017. The remarkable results show Honda’s commitment in ensuring safety for everyone sharing the road. *Variants without VSA (Vehicle Stability Assist) and SBR (Seatbelt Reminder) for both front occupants are rated 4-stars. **For the Civic (MY2016) and HR-V (MY2015) rating, variants without SBR (Seatbelt Reminder) for both front occupants are rated 4-stars.